With the LED technology the use of a reflector continues but with more advanced materials, coatings, surface and design. 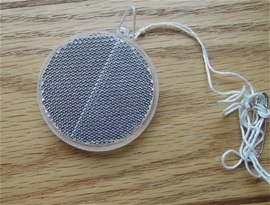 It is important that the reflector does not rattle because of different reasons. 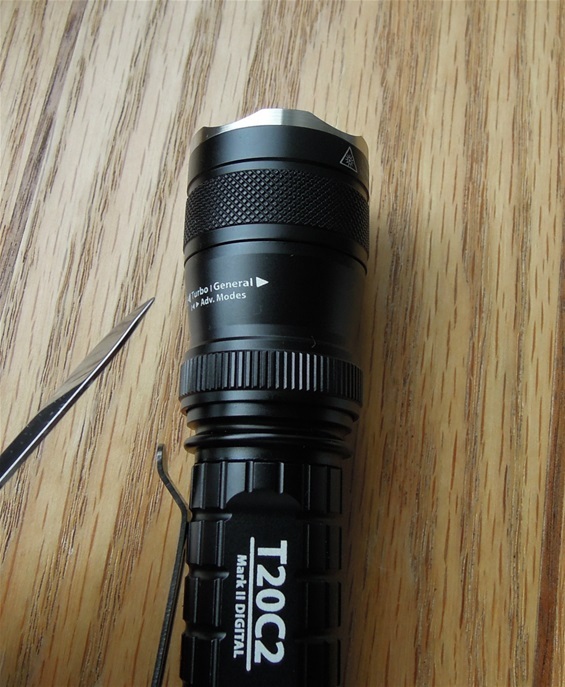 The EagleTac T20C2 Mark 2 is a digital flashlight with some high technology. First I would like to mention that the operating of the modes with the turning head design is interesting. 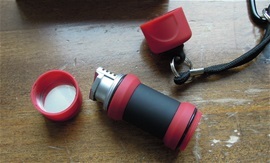 On such a flashlight like this it is a typical example on light discipline knowledge because using the different modes and to know it require training. Know your tool! This flashlight got a Switch in the back of it to turn it on and off with additional functions. This flashlight got a rather advanced circuit to operate the modes and to secure the LEDs performances. This flashlight is for the more professional users and people that are into LEDs. The MagLite LED AA is a good product. I like it very much and it easy to use and it does not require and special light discipline. The light output is fair and it can be used for many small things included distress signals. The handle is very comfortable on this and it does not have anything in the way and additional functions. It is operated by two Alkaline AA batteries that last awhile and the modes are operated by turning the head. The only thing to remember is not to overturn “turning head” flashlights. This flashlight got a balance in design, output and energy needs. 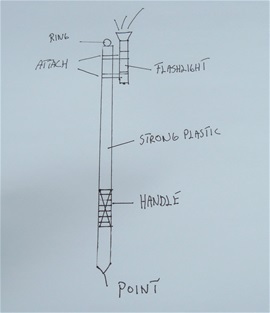 On the picture is one of my ideas for a tactical stick for rescue services. It is just a simple drawing. For rescue purposes the need for a longer arm is needed for example looking into holes in the ground or inside bushes. The point is to secure it in the ground if needed and the ring is to hang it up. The best material for a tactical stick is strong plastics. A tactical stick may have many uses for rescue work. Signaling with fire or reflections is ancient and very useful. A possibility to signal with a flashlight with different colors can be done. There is a limit for the different color depending on distance and weather. The use of filter lights can be used for weather conditions and close range light use. The white light can be focused and seen from great distances but there is a limit for sure. With the LED technology today with the extreme output and focus then it is a light that can be seen from some distances. I believe a flashlight can be incorporated with more advanced technology and forms of communications. 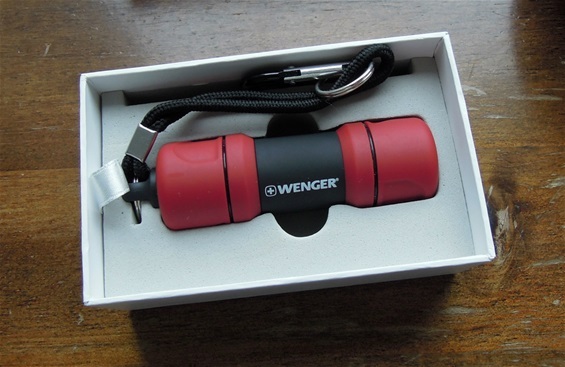 On the picture is the Wenger Clava lighter with a signal mirror..
Red lights can be used around people to prepare for the dark. It can be used to prevent negative influence on the night vision. Small signaling LED flash distress or signaling devices can be used for many situations. They are water resistant and the battery last for many hours. These can be used with different colors to mark a place or path. Small devices like these cost practically nothing but they are very useful. These can be attached around a rod or other places for use. Best is the use of a switch in the back with two power modes. The two modes are one full and one economy mode. 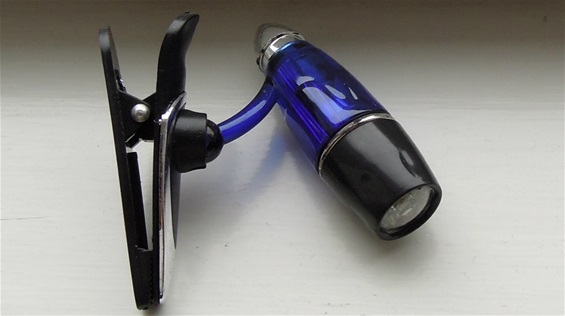 It is very useful with a focus on a flashlight that is easy to control with the thumb. A possibility to have a lanyard and that the handle is comfortable are important as well. The light output must be in balance with the heat transfer and durability of the LED. It is also important with all the small details with battery module and threading. If signaling is difficult with a switch then just use the hand. I remember when the Led Lenser T7 was introduced that this was really nice technology and a good product. I still feel that this is a very useful and easy to operate construction. Usually the flashlights today are only used on and off and nothing more. The T7 have all these factors mentioned. Light discipline can be minimal and one does not get to demanding on power because it is the same thing with a SAK. If you can use a small blade without damaging it then you know correct use. 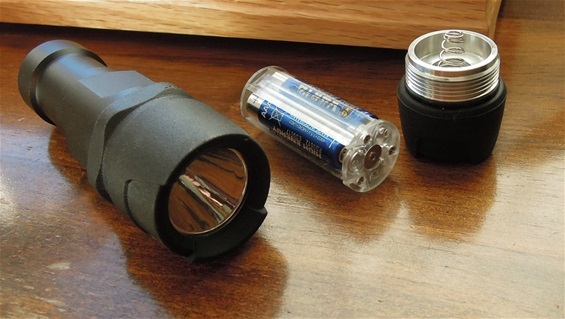 A small LED flashlight can be used in many different situations and for rescue. 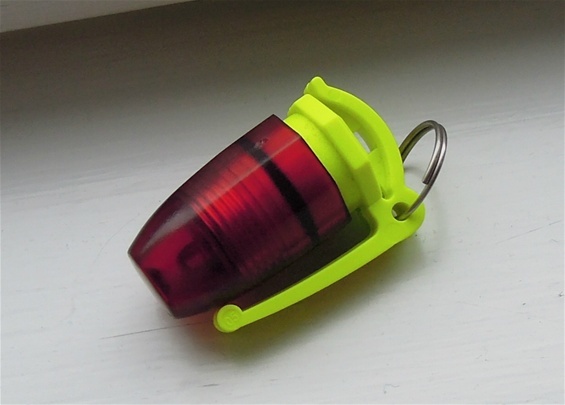 A small LED can be attached to a life vest or it can be used on a rope. In a situation in the dark with rope then it is possible to attach one on the rope to mark it. If you throw a rope in the water then It can be difficult for a person in the water to see the rope even if you have a flashlight in your hand pointing. A “tactical stick” device can also be used in water and as a helpful tool on the ice. A tactical stick can be used for medical uses. It is a long list. A simple reflector can save your life and it is a multi-tool. If people only knew all it can be used for and in combination with a flashlight especially. Cheap light for indoor use. It works well for display purpose.